This is probably the most comprehensive and best book out there on trauma at this moment of time. If people have suffered severe trauma it can be extremely difficult to experience anything even remotely close to inner peace. This book gives both deep insight into trauma and gives a wide range of options one can explore to transform it. Bessel van der Kolk has been treating people with severe trauma for over 30 years and explains in great detail, from his scientific and practical viewpoint, how trauma works, how trauma sets into our body, brain and mind, and what the options are to explore the transformation of this trauma. 1) The rediscovery of trauma. 2) This is your brain on trauma. 3) The minds of children. 4) The imprint of trauma. Reading this book really helps people understand how trauma works and how it can influence people and their behavior. If people are dealing with trauma, like child abuse, physical or sexual abuse, having been in a war and been witness to murder then this book can really help. This book is really about the heavy stuff that can happen to people in life. Trauma is a fact of life. Veterans and their families deal with the painful aftermath of combat; one in five people in the US has been molested; one in four grew up with alcoholics; one in three couples have engaged in physical violence — the body keeps the score. That’s how Dr. Bessel van der Kolk, one of the world’s leading experts on developmental trauma, explains how our long-term health and happiness can be compromised by prior exposure to violence, emotional abuse, and other forms of traumatic stress. In his book, Dr. van der Kolk explores how treatments — ranging from meditation and neurofeedback to yoga, sports, and drama — offer new paths to healing and wellness. The book is also interesting for anybody who wants to understand this subject better just out of curiosity, or maybe you know people who have severe trauma and then this book can really help to understand those people better. In this lecture the writer of the book speaks about the subject substantively. The book is a great foundation for understanding and overcoming trauma. And I would recommend anybody with an interest in this field to read it. 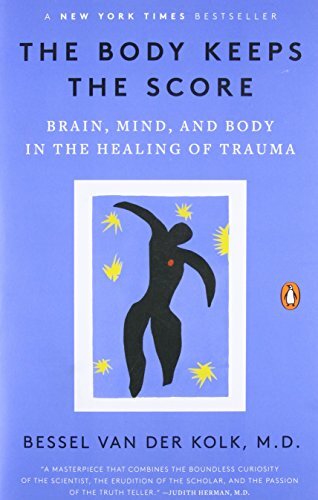 Even though severe trauma may never be totally overcome this book and the various treatment options it explores should definitely help people find more peace within themselves again.